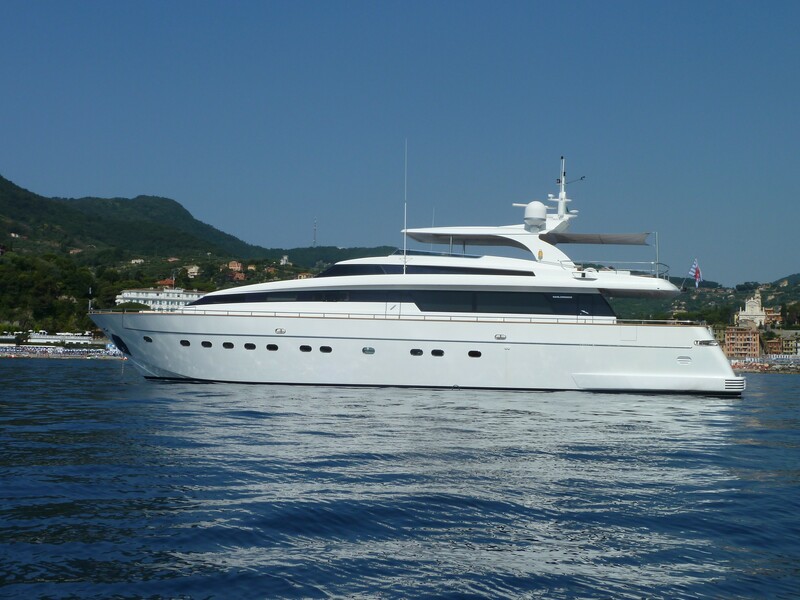 Motor yacht SUD (previously LUNA Y SOL) was delivered by Sal Lorenzo in 2007; she features in-house design by San Lorenzo and measures 30m (98.5ft). 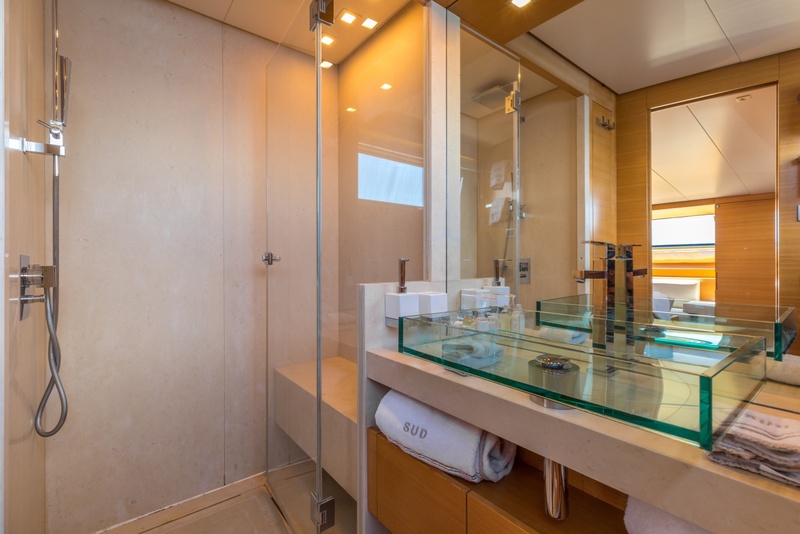 M/Y SUD received an extensive refit in 2013 and boasts sumptuous accommodation for up to 8 charter guests, in 4 en-suite cabins. SUDS interior décor is refined, contemporary and timeless. 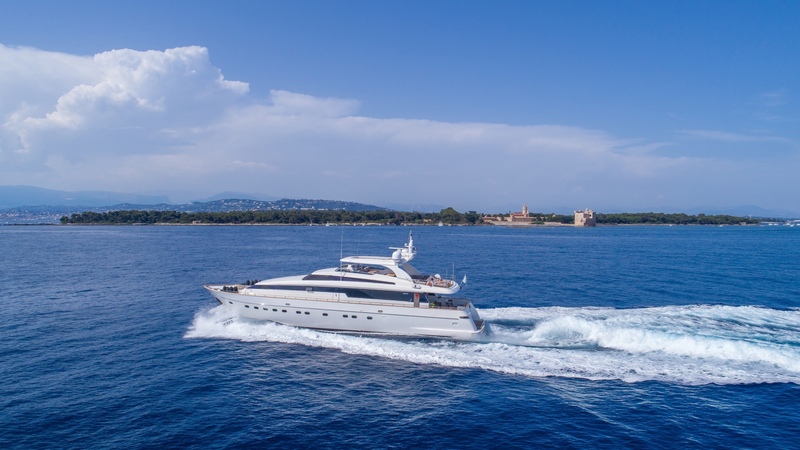 The salon offers a generous lounge aft and formal dining forward. Crisp white soft furnishings, high gloss white panels and light-toned joinery, create a minimalistic and stylish ambiance. With full entertainment systems, the salon is ideal for a relaxed evening of movies. Thanks to the panoramic windows, the salon has a fabulous open and airy atmosphere, perfect for socializing. 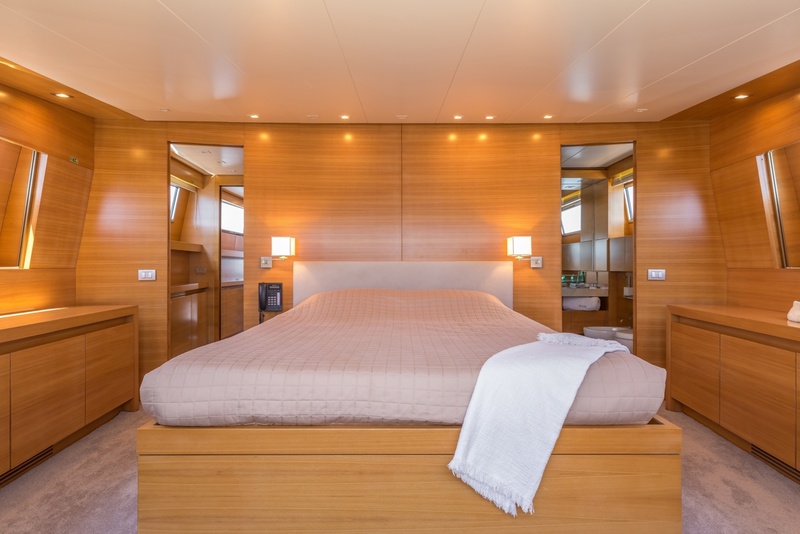 Guest accommodation is in one master cabin on the main deck forward, and 3 guest cabins on the lower deck. 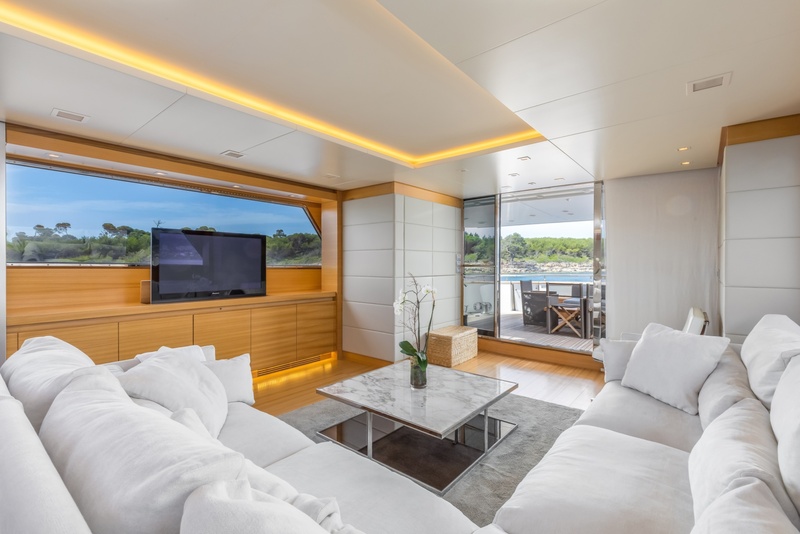 The exterior living is plentiful aboard the San Lorenzo motor yacht SUD. 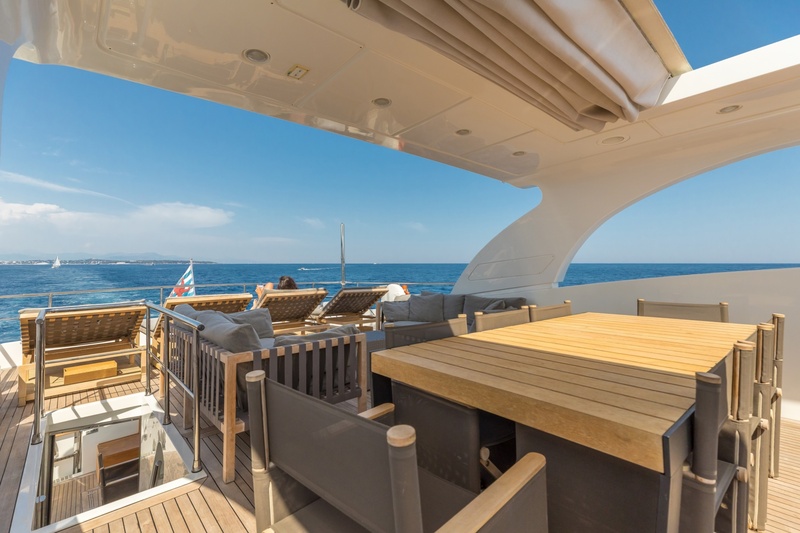 Adjacent to the salon is the aft deck and alfresco dining option. 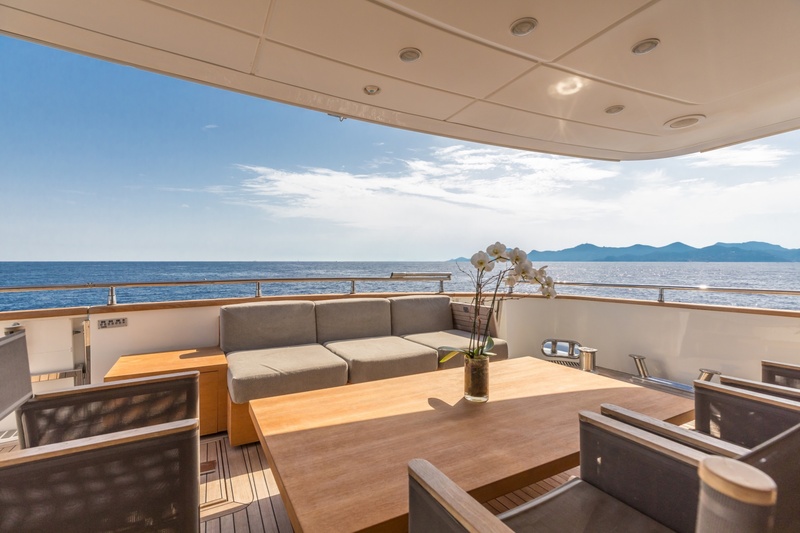 Ample seating, shade and roll away sun shield make the aft deck ideal for any time of day or night. 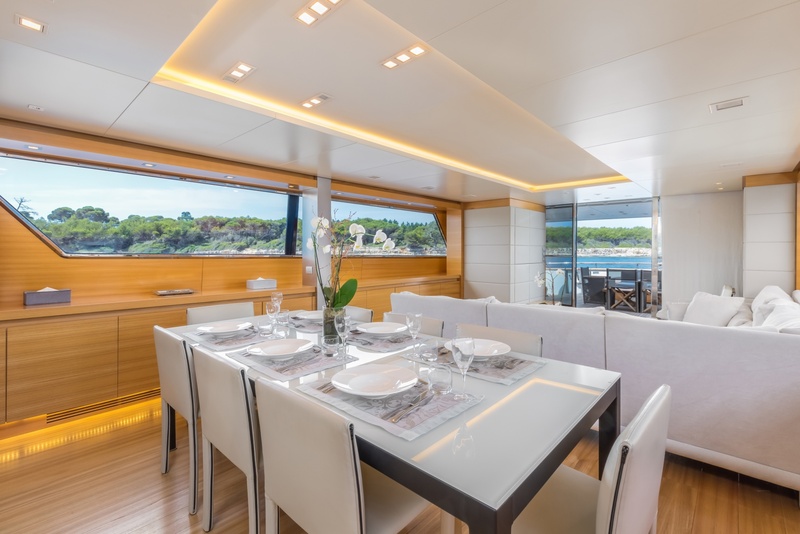 The main deck wraps around the yacht and leads to the well-appointed foredeck, where an additional alfresco dining option is perfect for light lunches and evening canapés. 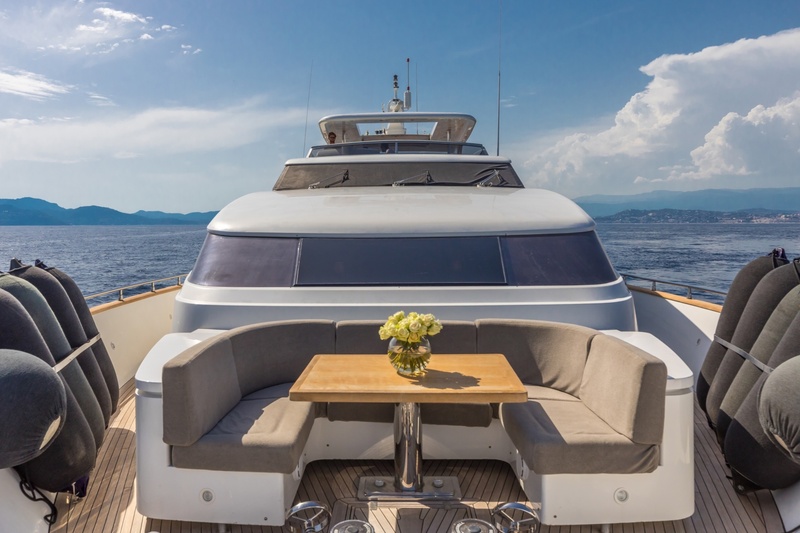 M/Y SUD has an upper sundeck, offering an alfresco dining option, comfortable seating area, coffee table, chaise lounges and partial shade, with a retractable rooftop. For the water enthusiasts, SUB boasts a good assortment of water toys, all easily accessed from the swim platform. 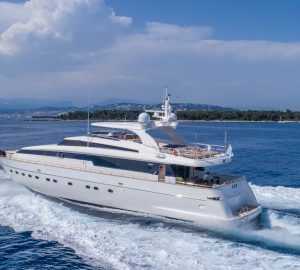 Motor yacht SUD is powered by 2 x MTU 2000hp engines and is capable of cruising speeds of 22 knots and top speeds of 25 knots. 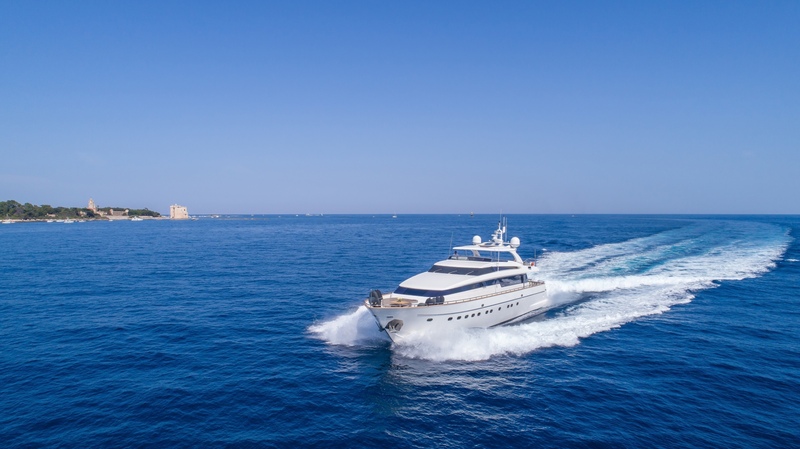 SUD is fitted with both zero speed and underway stabilizers, ensuring optimum guest comfort. 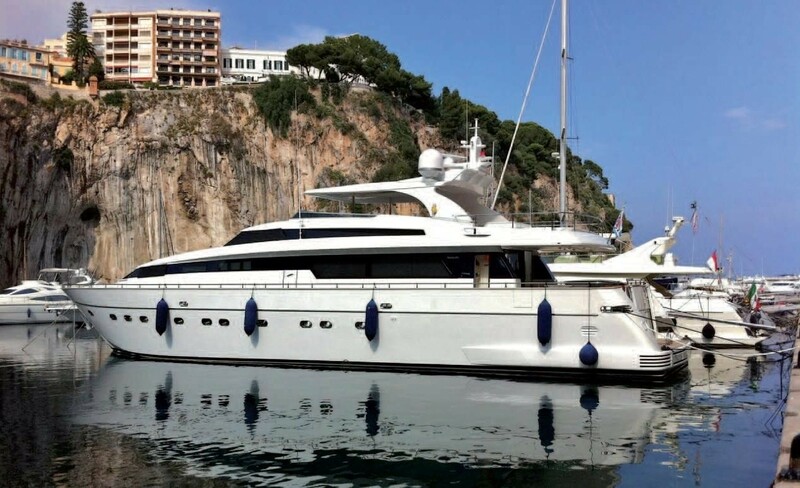 Luxury charter yacht SUD can accommodate up to 8 guests, in 4 en-suite cabins. 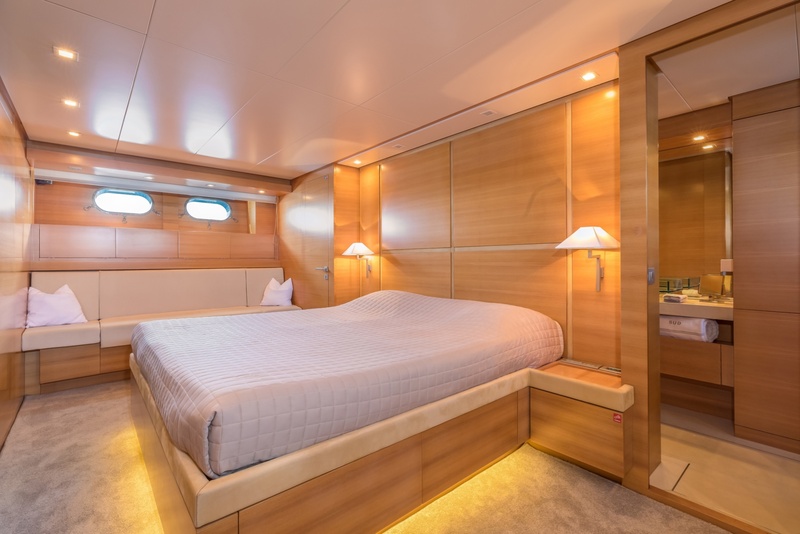 The master stateroom is on the main deck forward and full beam of the yacht, with a center lined double bed. 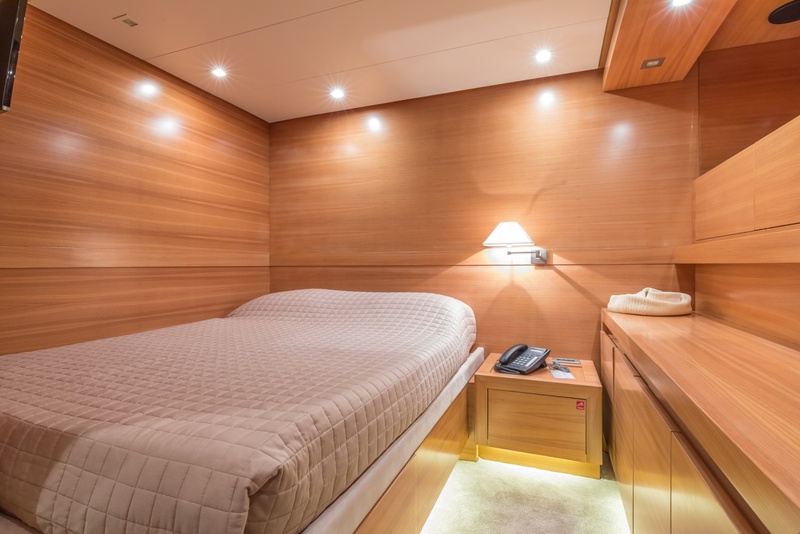 The VIP cabin is on the lower deck and offers a full beam layout, double bed, sofa, vanity and walk-in wardrobe. 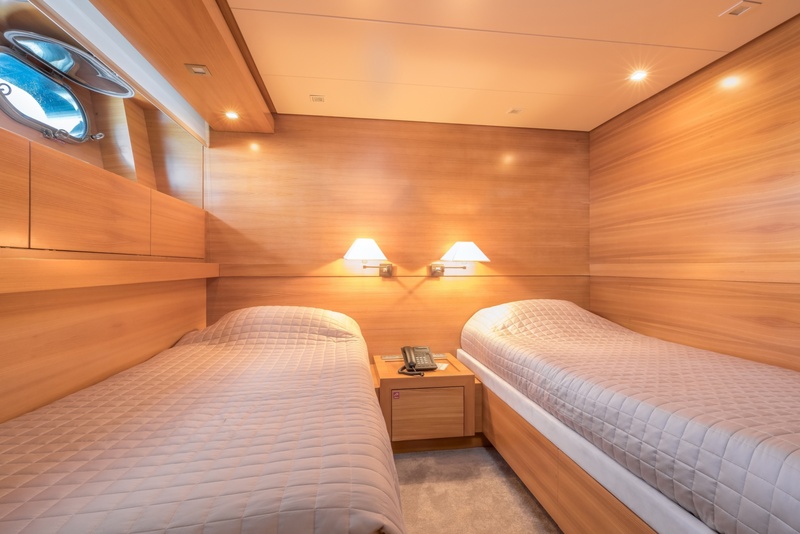 A double cabin on the starboard side has a double bed, while a further guest cabin to port offers side by side twin beds. All cabins feature TV/DVD entertainment systems.